Kavir (Desert) National Park is a 400,000-hectare (1,000,000-acre) protected ecological zone in northern Iran. The park is located 120 kilometers south of Tehran and 100 kilometers east of Qom, and it sits on the western end of one of Iran’s two major deserts, the Dasht-e Kavir (Sand Desert). 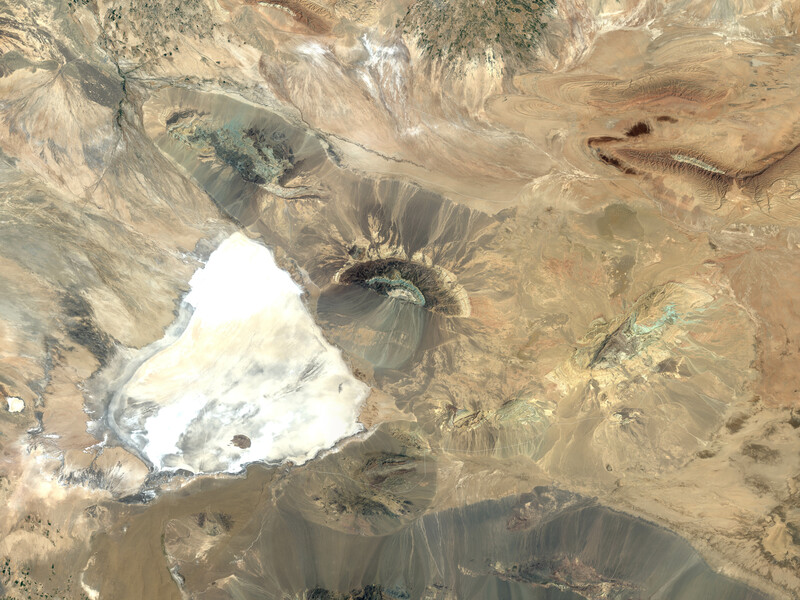 The Landsat 7 image above shows the stark landscape of the park. 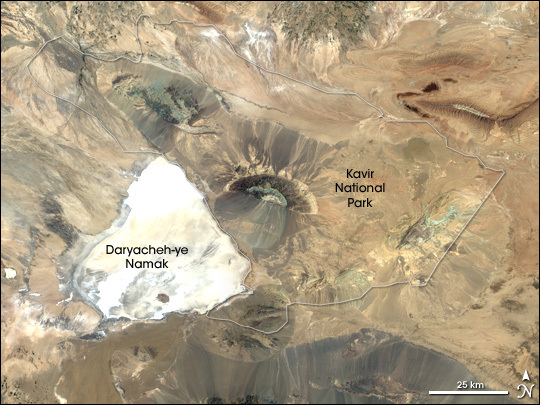 The scene is dominated by Daracheh-ye Namak (Salt Lake), the huge white salt pan immediately outside the park boundaries. This is actually a salt marsh, and water flows into the lake from the north via the Qom River, which also flows through the northern part of Kavir National Park. The Qom is one of the very few permanent rivers through the entire desert expanse in Iran. Other prominent features include the high reefs of elevated rocks in the park, and streaked-gray fans of alluvial wash spreading from the base of these outcroppings. The area appears quite barren and brown, though it is populated with a sturdy desert scrub. The large, semi-circular rock outcropping in roughly the park’s center is Siah Houh (Black Mountain). Beyond the park’s eastern boundaries are the Sand Desert and Central Desert to the south. The park encompasses landscapes of desert and steppes, and is sometimes known as “Little Africa,” for its safari-like wildlife, including native goats, rams, hyenas, wolves, gazelles, leopards, the rare Asiatic cheetah, and the Persian panther. Typically, the area receives around 150 millimeters (6 inches) of rain a year, most of which falls between November and May. The vegetation in the region is adapted to drought and salty soils. To retain water and combat grazing by animals some plants grow leaves with thorns, much like thorn trees and bushes found in Africa desert landscapes. This image combines data from two different satellite overpasses of the area collected by the Enhanced Thematic Mapper Plus (ETM+) on the Landsat 7 satellite. The left half of the image was acquired on August 28, 2000, the right half on September 7, 2001. The imagery combines red, green, and blue wavelengths of reflected light to create a natural-color view (ETM+ bands 3, 2, & 1).